***PLEASE NOTE: BigCommerce doesn't yet provide us all of the web-hooks necessary to be able to note all Product changes (specifically ones that are saved inline/automatically by BigCommerce), and so we strongly recommend clicking the "Save" button on your Product page periodically when updating/editing a Product. At this time, you can only rewind Products one-by-one from your end of the app's UI. 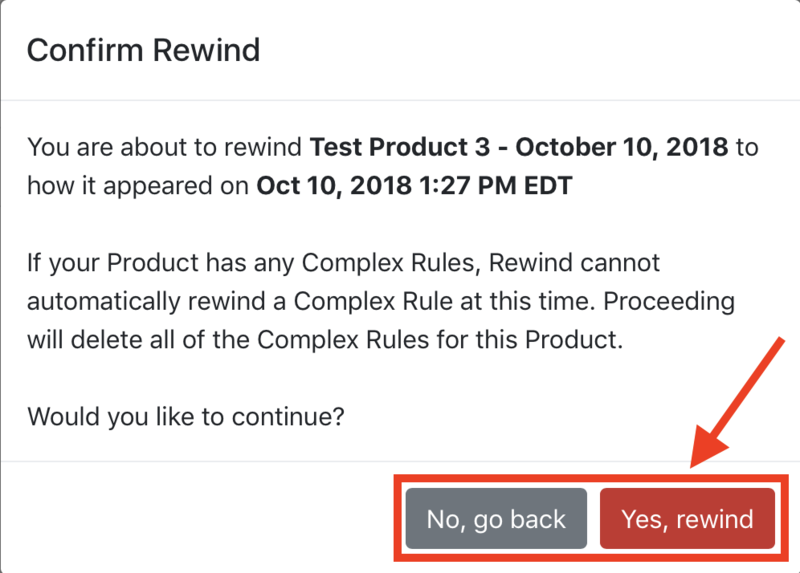 However, if you need to rewind multiple Products, or all of them at once, simply contact us directly at help@rewind.io with this request, and we'd be happy to perform the task on your behalf. 1. You can locate the Product you're looking for either by searching it (by name, SKU, key words, etc.) in the Search bar, or by filtering the results by selecting Product. As you'll see, the Product filter tag will now be highlighted and move to the front of the filter tag list. The results will now only display your Products. You can choose to further narrow down the search further by using the Search bar, if desired. 3. To expand on the details of that Product, click on the '+' sign. 4. 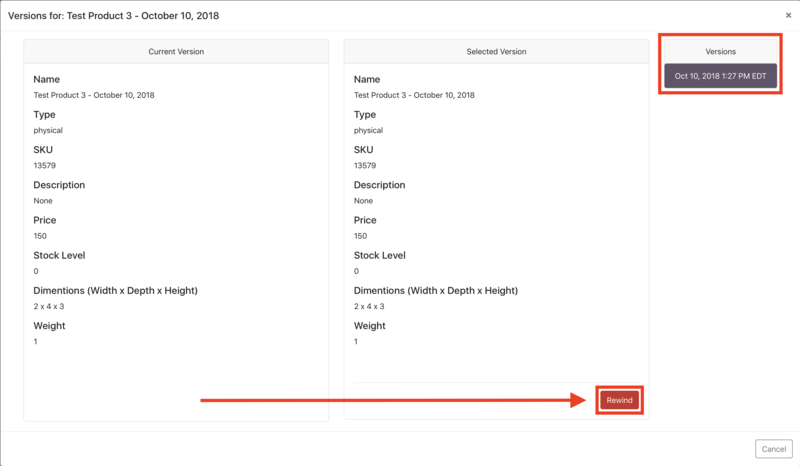 By default, you will now be able to view that Product's name, SKU, if it's currently Available within your shop, and what time it was either added, updated, restored, or removed to/from the shop and Rewind Vault. To view the actual backed up versions of that Product, click on 'View Versions'. 5. Here, you will see the current/active version of the Product on the left-hand side of the page, which can then be compared to whichever Version of the Product you select. You can also scroll through and view other saved versions of the Product under Versions, on the right of the page. To rewind the selected Version, click the red 'Rewind' button. 6. A disclaimer will pop-up, confirming which Product you're about to rewind, and the date/time it will be rewinding back to. This disclaimer also warns about our current limitation in rewinding Complex Rules, so always ensure to read the entire disclaimer before agreeing to the rewind. If you do not with to proceed, click 'No, go back' to cancel the rewind. If you do wish to proceed, click 'Yes, rewind' to start the rewind. 7. After the rewind has completed, a pop-up will appear with this confirmation. Click 'Done' to clear this pop-up and return to the Rewind app homepage. 8. You'll see that the restored Product is now at the top of the list in the Vault, and that its status has changed to Product Restored. You can also now click on the 'Product' filter tag again to de-select it, so that ALL backed up items will once again be displayed in the Vault. How often will my Products be backed up? We will automatically backup Product changes each night during your store's daily automated backup at 12am local time for all customers. Customers on our New Business plan and higher will also have Product changes saved in real-time, as well as the ability to kick off a manual backup of their whole store whenever needed.